This chicken spaghetti salad is a very popular recipe especially in the Western World. It is usually prepared with fresh tomato sauce. It is best garnished with chicken and salad. It is highly nutritional and very easy to prepare. 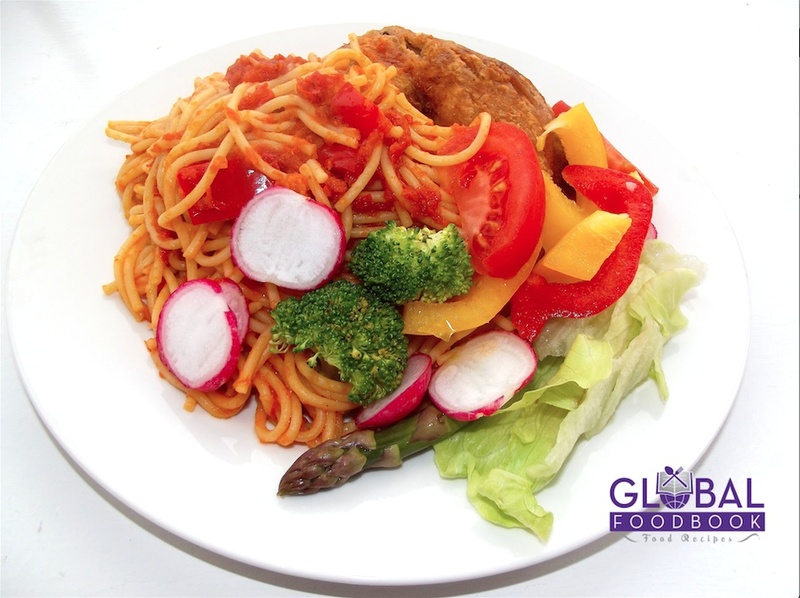 Follow the simple steps outlined below to enjoy chicken spaghetti recipe. 2 tins of chopped tomatoes. Add spaghetti in a boiling water and cook until tender (drain water & set aside). Season chicken with salt and seasonings and grill in the oven. Once chicken is grilled, set aside. Wash and cut the salad vegetables into small bits (set aside). Add olive oil in the saucepan and allow to heat up. Stir in onions, garlic, ginger, pepper and tomatoes and continue stirring until thickened. Add the spaghetti in the tomato sauce and mix thoroughly. (simmer for 4 mins). Bring down from fire and serve garnished with chicken and vegetable salad.